Yeung, Henry Wai-chung (2002), 'Deciphering citations ', Environment and Planning A, Vol.34(12), pp.2093-2102. Yeung, Henry Wai-chung (2002), 'Producing "the firm" in industrial geography III: industrial restructuring and labour markets ', Progress in Human Geography, Vol.26(3), pp.366-78. 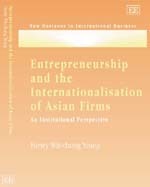 Yeung, Henry Wai-chung (2002), 'Entrepreneurship in international business: an institutional perspective ', Asia Pacific Journal of Management, Vol.19(1), pp.29-61. Yeung, Henry Wai-chung (2002), 'The limits to globalization theory: a geographic perspective on global economic change ', Economic Geography, Vol.78(3), pp.285-305. Yeung, Henry Wai-chung (2002), Towards a Relational Economic Geography: Old Wine in New Bottles? , Paper Presented at the 98th Annual Meeting of the Association of American Geographers, Los Angeles, 19-23 March 2002. Click here for Tables 1-2 . Yeung, Henry Wai-chung (2002), 'Doing what kind of economic geography? ', Journal of Economic Geography, Vol.2(2), pp.250-52. Yeung, Henry Wai-chung and Lin, George C.S. (2002), Theorizing Economic Geographies of Asia , Invited Paper Presented at the Canadian Association of Geographers Annual Conference, Toronto, Canada, 29 May - 1 June 2002. Henderson, Jeffrey, Dicken, Peter, Hess, Martin, Coe, Neil and Yeung, Henry Wai-chung (2002), 'Global production networks and the analysis of economic development ', Review of International Political Economy, Vol.9(3), pp.436-64. Yeung, Henry Wai-chung (2002), 'Transnational entrepreneurship and Chinese business networks: the regionalisation of Chinese business firms from Singapore', in Thomas Menkhoff and Solvay Gerke (eds. ), Chinese Entrepreneurship and Asian Business Networks, London: RoutledgeCurzon, pp.159-183. Yeung, Henry Wai-chung (2002), 'Business as usual? Changing business networks in Pacific Asia in a globalizing era', in Yue-man Yeung (ed. ), New Challenges for Development and Modernization: Hong Kong and the Asia-Pacific Region in the New Millennium, Hong Kong: Chinese University of Hong Kong Press, pp.131-60.